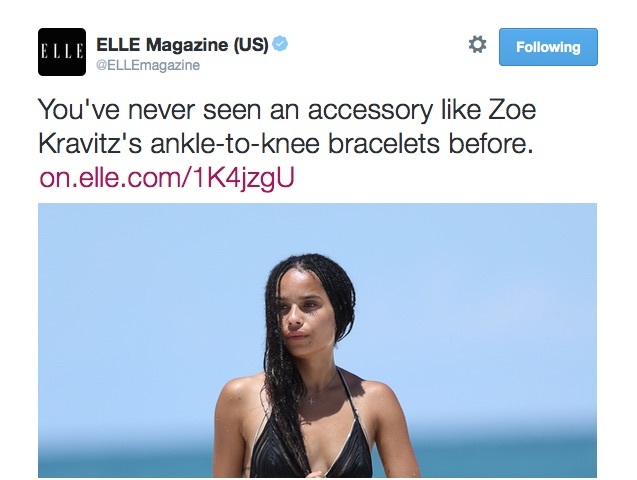 Told You So … You Need Leg Jewelry! Naturally, when I saw this tweet from Elle a month later, I went on high alert. Anyway, to make it easier for you, here is the leg look Elle was tweeting about. Click and you might get to the photo in the slideshow. On the other foot, it’s a slideshow and old photos get lost. I’ve got no other information on the chains, because, like I said, there’s no story, but it’s a pretty fabulous look. On the other hand (or foot), it’s probably too extreme for non-celebrity types, so I still recommend going with my totally wearable anklet. The silver anklet seen on Eryn Patton. She wears it every day! Click to shop. Expect to see more leg, ankle and foot jewelry next year. Remember that this June, the Wall Street Journal did a story on the comeback of hoop earrings; my prediction of a renewed interest in hoops was posted in July 2014. Just sayin’! I like the leg jewelry, and I’d actually wear these. And ankle bracelets in general. I hate the “bait and switch” tweet. LOL, thank you very little! … You’ve been a tremendous lack of help!